What is the Difference between IBS Pain and Appendicitis? 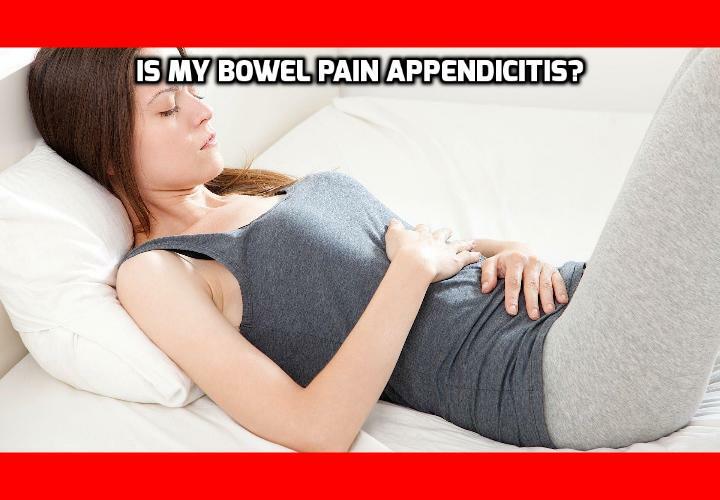 Is My Bowel Pain Appendicitis? Recently there have been many questions asked about symptoms related to bowel and abdomen pain. One asked specifically about treating appendicitis. This raises red flags for a couple of reasons. Appendicitis is a serious condition that, left untreated, can actually kill a person. Lumping this problem into the category of general bowel problems that one can treat naturally is not going to end well. So, we decided to have a look at appendicitis and explore the symptoms, diagnosis, and treatment plan. To begin with, it is important to know just what the heck an appendix is. Where is it? What does it do? The appendix is a little pouch, or closed tube that juts out from the large intestine right before the ascending colon. As for what it does…even despite centuries of speculation and research, no one knows really. There are some pretty good theories, to be sure, but none have ever been able to be proven. What everyone can agree on, however, is that it isn’t exactly a critical organ and we can live without it and not even have any bad consequences. Anytime the suffix ‘-it is’ is used, it means an inflammation, usually as a result of infection. When the appendix becomes infected and inflamed, it doesn’t fix itself. There are no potions, herbs, exercises, or meditations that will cure it. Appendicitis is one of those conditions that is considered progressive, meaning it will just get worse and worse. The swelling appendix will burst if not treated immediately, and this puts the entire body at risk of a septic emergency. But let’s back up. What are the symptoms? Generally, they are the same for most people. They include intense pain at the lower abdomen near the right side of the body. It can even start at the bellybutton and intensify as it moves downward. With abdomen pain will also generally come loss of appetite and nausea or vomiting. A lot of times a fever will develop as well. The problem sometimes arises when people confuse severe constipation, gas, and nausea with what actually is appendicitis. These symptoms are also present in IBS and other gastrointestinal conditions. The key differences are the timing of the symptoms and whether or not a fever is present. By timing I mean when and how the symptoms start. Was it sudden or did it develop over a number of days? Appendicitis is usually something that comes on fairly suddenly and doesn’t improve over time. IBS can be sporadic. Periods of pain, diarrhea and constipation followed by relative peace are the more likely scenarios. The fever is a bigger giveaway. IBS doesn’t typically ever include fever. A distended bowel isn’t always going to accompany IBS but many times will with appendicitis. While IBS sufferers have had some bloating, actual distention is altogether different. When is it time to call the doctor? Look at the collection of symptoms. Pain starting at the navel and intensifying as it goes south, fever, vomiting, loss of appetite and distended belly are the red flags. Your doctor will let you know If you need to go to the emergency room. However, most folks know by the level of pain, vomiting, and other symptoms when it’s time to skip the phone call to the doctor and just go straight to the ER. Let your body guide you and be sure to listen to it. However, as mentioned above, only a doctor or midlevel can diagnose this condition. He or she may, in addition to questioning you, palpate the area (place his or her hands on the lower bowel), listen with a stethoscope, take some blood to look for infection, test urine to rule out other conditions, and order radiology services such as a sonogram or CT scan. After a diagnosis is made, treatment begins. Unfortunately, there is no treatment other than surgery that has ever been shown to be effective at eliminating the problem. An appendectomy removes the failing, infected organ and usually won’t leave much of a scar if caught early enough. If the appendix ruptures and causes peritonitis (infecting the rest of the abdominal cavity), then a larger incision is generally needed because the bowel will have to be irrigated. Antibiotics are given to guard against further infection complications. Depending upon the severity of the infection and the invasiveness needed to correct it, recovery time can be anywhere from 3 days to even 2 weeks. Usually a week is standard if there are no complications. At the same time that there is no alternative to surgery once appendicitis is discovered (if you want to actually recover), there is also no real way to prevent it. However, studies have shown that people who eat a very high fiber diet are less likely to be afflicted with it. Hopefully, this can be good information to share with the family to help discern between a chronic bowel issue and a medical emergency. If your problem is just IBS and you want a natural, prescription-free way to manage and conquer it, I encourage you to try the Treat IBS Naturally guide today. Why Chronic Fatigue Syndrome Symptoms are Strikingly Similar to Hypothyroidism Symptoms? Who Can be Affected by Tonsil Stones? How Allergy Makes this Blood Pressure Drug Deadly? What to Eat for Getting Rid of Double Chin? Which Doctors May Treat Bad Breath? What are the Causes of Extremely Oily Skin at Middle Age? How Best to Drop Cholesterol Absolutely? What is the Best Way of Eating to Cure All Disease? What did Research Say on this Weird Arthritis Heart Attack Link?